Weird, heartfelt, and everything in between. 1. 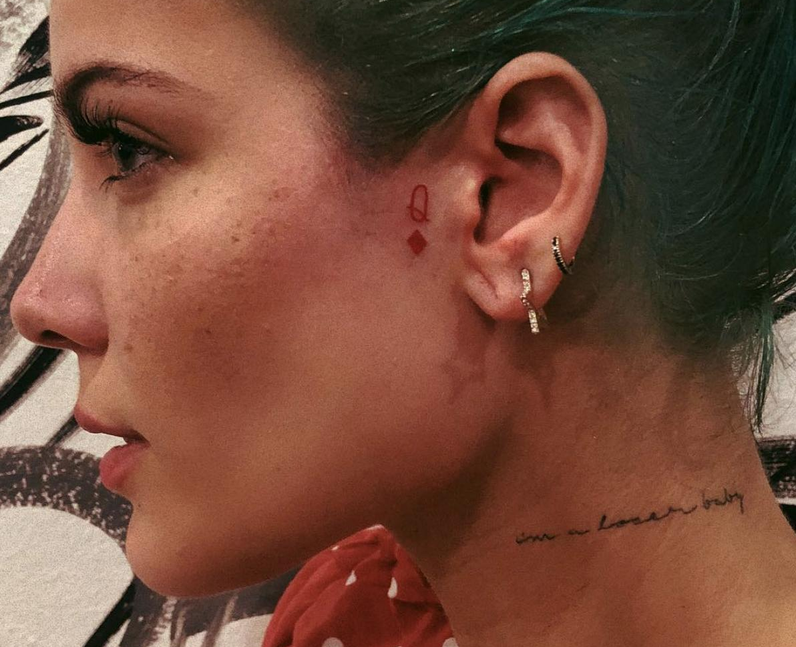 Halsey just got the cutest face tattoo of all time. 2. The internet is losing it over Post Malone's two new HUGE face tattoos. 3. Pete Davidson just got Ariana Grande's initials tattooed on his hand. 5. Zayn has pledged his allegiance to the Dark Lord with a huge tattoo of He Who Must Not Be Named. King of Tattoos Zayn is back at it again causing a stir with his new ink. It’s only been a few months since he got Gigi’s eyes tattooed onto his chest and thanks to a new Insta pic, it looks like he’s now got a questionable tattoo of… Lord Voldemort. Yes. Really. The Slytherin prince literally went to the tattoo shop with a screenshot of Voldemort from the 'Deathly Hallows Part 2' and got it permanently inked on his leg. We just wanna know how Ralph Fiennes feels about this. He's peaked, surely? Ya boi Zayn Malik, certified king of tattoos and hair dye, has only gone and got another tat, hasn't he? Zayn had a pair of eyes inked on his chest and fans are freaking out because they look EXACTLY like Gigi Hadid's. While that sounds cool, people are really starting to worry because of what happened last time he got girlfriend-inspired ink... Remember that Perrie Edwards tat her had on his arm? He had to get that covered up pretty sharpish after they broke up... Awks. Bella and Dani Thorne probably get mistaken for twins all the time. That's why their matching foot tattoos are totally appropriate. Both girls got "If lost, return to twin" tattoos done by Daniel Winter and it's the perfect way to pay tribute to their amazing relationship. 10. Hayley Williams' Warped tattoo marks the time she survived a seriously scary storm. Hayley got her Warped tattoo to symbolize her love of Warped tour and a near death experience during a storm. What a better way to celebrate life and love than with a permanent reminder of a terrifying and amazing experience. 11. Sarah Urie's eye art is pretty and mysterious. Sarah Urie hasn't gone into too much detail about her triple eye tattoo, but has explained that she liked the art. Sometimes art doesn't have to be overly sentimental. You are allowed to just enjoy the art. Jenna's first tattoo was the triquetra she has on the base of her neck. The triquetra can mean a few different things in Wicca as well as Christianity. In the Christian religion it is meant to symbolize the father, the son, and the holy spirit. For Wiccans it is meant to symbolize the maiden, the mother, and the crone. 20. Ed Sheeran's penguin tattoo says meow above it and it's a complete conundrum. Ed Sheeran has a lot of freaking tattoos and not all of them make sense to the average person. Here is a tattoo of a penguin holding a hobo bag with the word "meow" written above it. Singer Kehlani has a ton of tattoos but the sunflower on her shoulder certainly shines brightest. She hasn't spoken much about its meaning but sunflowers are renowned for their love of sunlight and ability to adapt for the brightest conditions. It's easy to guess the inspiration behind Ashton Irwin's wrist tattoo. 5 Seconds of Summer changed Ashton's life so it's pretty fitting for him to proudly rock the symbol of their band. 23. Bella Thorne's wild kitty proves how spontaneous she can be. Bella Thorne is known to get her tattoos on the fly. So, when she debuted her "wild kitty" ink on the back of her ankles, no one seemed to bat an eyelash. Wild kitty? Sure, why not.